Vancouver Island sits immediately off Canada’s Pacific coast with Victoria, the capital of British Columbia, nestling in the southern tip. It is a haven for exciting wildlife and is the nation’s culture and arts hub. It also has the mildest climate in Canada, boasting warm summers and winter temperatures usually above 0°C. Whilst in Victoria, be sure to visit the Robert Bateman Centre, which features around 160 stunning pieces by the country’s most popular nature painter. Walk through Point Ellis House and Gardens for a taste of what 1860s Canada was like for the social elite. It houses over 5,000 fascinating artefacts and a range of family photos of those who once lived there. On a sunny day, you can relax in the colourful gardens with tea and fresh-baked scones. Children will love the Victoria Bug Zoo. They’ll learn all about various Canadian critters and can take pictures with remarkable insects such as the dragon-headed cricket and three-horned scarab beetle. The capital has excellent cycling routes too. Rent a bike and visit as many of the English-style quirky shops and independent coffee bars as you can. Or stop off at Bastion Square, which was once a Victorian fort but is now a centre for excellent restaurants and boutiques. The Newcastle Island Marine Provincial Park, just off Vancouver Island's southeast coast, offers 22km of well-developed hiking trails and is an ideal destination for families. Here you can sit around a campfire whilst cooking the salmon you caught just hours before. Or you can spend your afternoon spotting the local wildlife, which includes grey whales, orcas, the Vancouver Island black bear as well as over 200 bird species. The fastest and most frequent ferry route to Vancouver Island is from Seattle in the United States to Victoria, which usually takes under three hours. There are also less frequent crossings from Campbell Island, Swindle Island and Prince Rupert, further up the coast. These routes all dock in Port Hardy on the north coast. 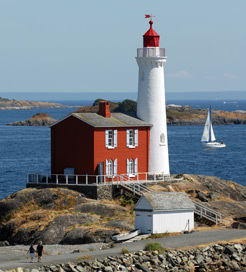 For more information, please visit our Ferries from Canada to Vancouver Island page.